This kit includes a Pull and Snake trainer and a Practice Plate The "Stretch Goal" training system helps you learn or improve your pull and push shots with 12 levels of difficulty, from Beginner to Impossible. Use this training device every day, and you will have a lightning fast pull shot in 8 weeks. The video shows how easy it is to install and use. 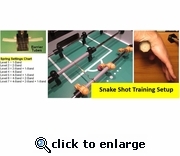 The"Snake Trainer" helps you learn or improve your Snake (aka Rollover) shot with 7 levels of difficulty and barrier tubes to force you to hit the outside holes. If you already have a pull shot, its time to learn the deadly Snake! This trainer also works for Euro shots. See the video for installation and use. The "Practice Plate" snaps in front of the goal to help you practice shooting the corners of the goal, which are the hardest areas to defend. It will improve the accuracy of your pull, push, rollover/snake, pull-kick, push-kick, euros, and most other shots. See the Demo Video tab for installation and use instructions. The "Practice Plate" snaps in front of the goal to help you practice shooting the corners of the goal, which are the hardest areas to defend. It will improve the accuracy of your pull, push, rollover/snake, pull-kick, push-kick, euros, and most other shots. See the Demo Video tab for installation and use instructions. Video Demo = watch Lou show you how to use his FoosTrain snake shot trainer. What tables does it work on? It works on Tornado, Warrior and Fireball tables.